I love Clarins, but in the past I have tended to overlook the brand’s make-up offerings in favour of their skincare. I am a big fan of their exfoliator, hand cream, bath products and, until recently, I was getting along very well with their HydraQuench moisturiser. For my cosmetic needs though, Clarins wouldn’t necessarily have been my first choice. But a couple of well-chosen Christmas presents have changed my outlook completely. I was lucky enough to receive an All About Eyes gift set, a brow kit and the gorgeous Barocco eye colour trio, all of which I absolutely love. The gift set, which was retailing here for about €24, contained a mini version of Instant Eye Make-up Remover (30ml) and a teeny 3ml of Eye Revive Beauty Flash along with the star of the show, a full-sized (7ml) version of Clarins Wonder Perfect Mascara. Now, I confess to never having heard of this particular product before, which saddens me as I’d have been saved the time and heartache involved in my ongoing quest for the perfect mascara. 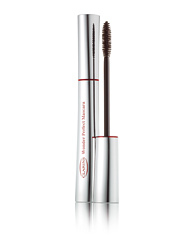 As its name suggests, Wonder Perfect Mascara is quite wonderfully perfect. I’ve been using Boots No 7 Exceptional Definition mascara which is a really lovely product, delivering great definition, separation and length. But, as I lamented in my initial review, it doesn’t give me the ‘fat lashes’ -- or volume -- that I’d ideally like. Clarins’ sleek silver tube of wonderful perfection really delivers, not only on volume, but on length and curl, too. Incredibly thick, volumized lashes, perfectly separated, no clumping. Infinitely long lashes, highlighted along their base by a superb eyeliner effect. Lashes with a spectacular curl that always remain supple. Sounds amazing, right? But the really amazing thing is that the product actually lives up to these promises. The only thing I’d question is the supposed eyeliner effect, which I really like the idea of but can’t spot in reality. But it tickes the boxes in all other areas. Apparently, natural plant waxes lend ‘thickening power’ to the texture, while the formula contains both an inbuilt lash conditioner and provitamin B5 as a lash perfector, too. Now, I am finding it ever-so-slightly smudgy on application, but it dries quickly and doesn’t flake or smudge throughout the day. And because it’s really thick, an intense colour and I’ve been lashing it on (no pun intended), I’m taking a two-handed approach to removing it, using the Clarins eye make-up remover with cotton wool first before my trusty Liz Earle cleanser. It’s available in black, brown or blue (I have the black) and if, like me, you expect miracles from your mascara and want a product that really does it all, then rejoice: your search is over. Never heard of it either but I'm getting me to a Clarins counter to try it out! @Karen, it's brilliant stuff alright, have uploaded a before and after shot in my latest post so you can see the difference it makes! @Lady V, you funny thing, you got it from Joe for Christmas the same as I did!